Due to this activity your students will learn to use information gained from illustrations (e.g., maps, photographs) and the words in a text to demonstrate understanding of the text (e.g., where, when, why, and how key events occur). Recounting stories is another teaching goal which will be accomplished, via stories including fables, folktales, and myths from diverse cultures. Lastly, students will learn to determine the central message, lesson, or moral and explain how it is conveyed through key details in the text. Click here to open this interactive lesson plan. Visit a country to learn about their culture and Christmas traditions. This interactive lesson includes two spinners. The first spinner decides which countries your class is going to visit by plane, in order to learn about their culture and Christmas traditions. 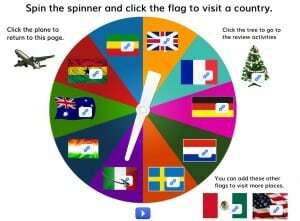 Spin the spinner and click the flag to pick the country your class is going to visit. By clicking the flag of the chosen country, a world map will pop up on your Smart Board. 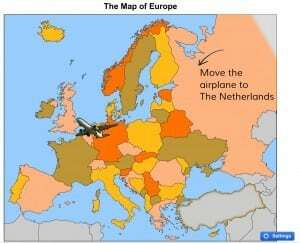 Let your students move the airplane to the country they are going to visit. Once your students arrived in the country, this lesson plan provides slides with fun facts about the country, like what the inhabitants eat during Christmas, how they name Santa, how children receive their presents and other fun facts. Click on the airplane image to return to the spinner and visit another country. The second spinner picks a fun game to review the information the students received before. 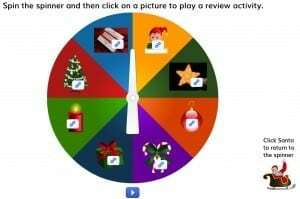 Spin the spinner and then click on a picture to play one of the review activities. The review activities consist of a Memory Game, Christmas Jeopardy, a Comparing games, Christmas Bingo and Christmas carols. 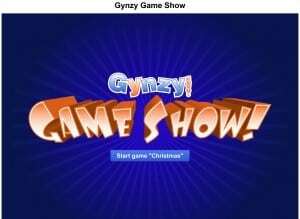 The first activity is the Gynzy Game Show, this game of Jeopardy includes questions about the Christmas traditions of the countries the students visited during the first part of the lesson. 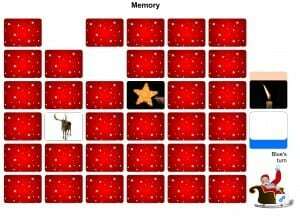 As a fun feature this lesson includes a Christmas themed Memory Game. Split the class in two groups, ‘the blue team and the orange team’ and play a game of memory. Are your students able to remember the differences between the Christmas traditions of two countries? Roll the virtual dices to determine which two countries your students will compare. Which country represents which number on the dices can be found under the flags of the country on the first spinner. 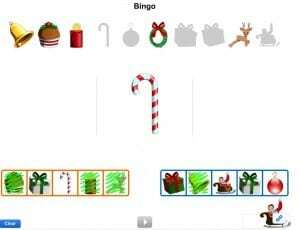 Another fun tool within this lesson plan is a Christmas themed Bingo Game. 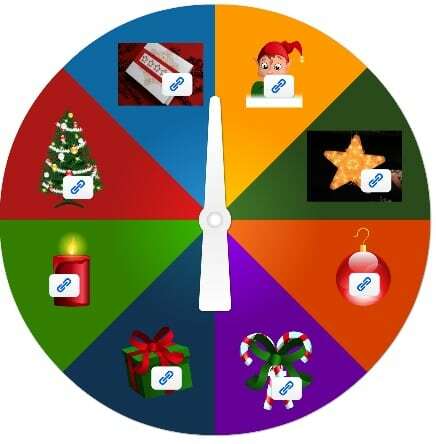 The interactive whiteboard tool randomly picks a Christmas image that might be represented on the student’s bingo cards. Finish your lesson with a Christmas Carol, like ‘Build a snowman’ or one of the other fun songs in this lesson plan. Do you like this lesson plan? Click here to open this lesson plan on your Smart Board.